Mike Compton does well what so many of us wish we could do better—he plays in Bill Monroe's bluesy style very well. Blues legend Robert Johnson used to change or hide his licks if he thought musicians in the audience were stealing. But Compton is a frequent teacher, in person or via Internet web cam, and he's the director for the 4th Annual Monroe-Style Mandolin Camp Sept. 11-13 at the International Bluegrass Music Museum in Owensboro, Kentucky. So what would Big Mon think of such a thing? "I think that Monroe would be very proud to know that his music has maintained so much interest in the modern day that entire camps are devoted to better understanding and using the style he created," Compton said. He'd probably also be tickled that a more accurate copy of his style remains somewhat elusive to a hobby hack like me. I've listened a lot to Monroe over the years, and I've sat playing along with records at times. But usually I get impatient trying to copy and just move on to a hybrid style. But some people do it well. What's the secret to busting through the roadblocks, or to be more accurate, the right hand blocks? "The main obstacle to learning Monroe style seems to be the right hand technique," Compton said. "Many people have a hard time using tremolo as the main exponent to creating melody, to keeping the right hand moving and not giving in to the temptation to play somewhat erratic right hand patterns. "I have found that the fiddle kinship with Monroe's right hand technique seems to require that the right hand keep moving and making the motions, even when the string is not struck, sort of a phantom stroke to keep the notes emphasized the right way. The tendency in people not used to using this technique is to change pick direction only on the next note in the melody. There is sort of a going backwards in time that needs to be done, back to the time in string bands when fiddles were the main instrument of choice rather than electric guitars, when a bow stroke or tremolo was the means of playing a sustained tone rather than striking a note once and counting on an amplifier to do the rest." Something else that's important, Compton said, is the ability to use chords in solos. "One of the other primary changes in thinking needs to come with an understanding of using chord voicings to find melody and harmony rather than using a more linear approach, playing more out of "boxes" rather than running lengthwise up and down the fingerboard," he said. "But to me, the hardest part and also the smartest part of the style is how Monroe could suggest passages to the listener without actually spelling the idea out. Dealing with abstract melodic ideas is a bit more challenging to understand I think." 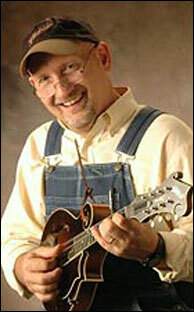 Compton is of course a longtime mandolin star in the bluegrass world. He's currently in another stint with the Nashville Bluegrass Band and also performing in other partnerships and solo. But I find his ability to teach fascinating, too. Compton likes to approach each student or group of students differently and assess what they need to learn, whether it's repetition or demonstration. And he doesn't shy away from high tech. Compton is often performing in overalls like he was fresh off the farm. But actually, he cultivates a lot of income giving mandolin lessons over the Internet via webcams. For instance, he'll plink off a few notes from home in Nashville, and a few seconds later, a student at home in Utah will be copying them. "The webcam lessons idea was presented to me by Brian Ray, an ex-Apple employee and self-proclaimed expert on all things orange (including mandolins...I keep telling him that "orange" is a fruit, not a mandolin)," Compton said. "Currently, I have over 160 people on the webcam contacts list. Of those, about 30-35 of those take lessons weekly. Some of the others take twice a month and a few others take occasionally. When I'm not on the road I usually spend from about 8 a.m. to 8 p.m. weekdays giving webcam lessons. I start about 8 a.m. and go until just after noon and break for a few hours, then resume around 3 to 4 p.m. and go through the evening until 8:30 to 9 p.m. Most people take 30 minute lessons, but I do have a couple who take for an hour. Really, I think 30 minutes is about max, but it depends on what the request is." You need plenty of computer power and Internet bandwidth for that system to work. "On a bad day some of my customers look like a Jackson Pollack painting," he said. Many people prefer a smoother, more even and modern sound than what Monroe produced from his mandolin. Myself, I've sometimes thought it ragged at times but always surprising and interesting, like where he was going depended on mood and feeling as much as practiced habit. "There are plenty examples of his work that show impeccably clean technique," Compton said. "What you will NOT find is careful music. I do not think that perfection is necessarily the object of expression. Squeaky clean and careful music bores me anyway. I would rather have music that shows commitment and emotional content than all the spit and polish in the world. To each his own, I guess, but I'd rather the music I listen to be unpredictable." Don't expect to pick up the style from gear choices, either. Compton said his study of Monroe, and knowing him personally, indicates that Monroe played with whatever pick was in his pocket. And though his one Loar is the vaunted one, he believes careful listening will show that Monroe also recorded with a number of different mandolins. It was the feeling put into this music coupled with right hand technique that built the style. The teacher doesn't expect the student to achieve the Master's mastery. "I don't know that it's possible to really accomplish that feat in one lifetime," Compton said. "There's so much to know and really, I've only begun to scratch the surface myself." His picks: "I do have a signature model pick with Red Bear called the "Taterbug Special". Dave Skowron suggested the idea and sent along a sample in the mail one day and from there we've worked on making a pick size/shape that I like. I'll say that they're just about right now. I don't use any one thing all the time, though I have used the last pick I got from Dave pretty much exclusively. I have a few tortoise shell picks around that people give me and I like them fine, but I don't use them much because they cost too much and require some amount of maintenance. I have other things I'd rather be doing." His mandolins: "Right now I'm using a couple of Gilchrist mandolins, an F5 (#536) and F4 (#565), and a Duff H5 (#13307) mandola. The F5 I have now is the fourth one of Steve's I've owned and it's by far the best suited for what I like. The F4 was sort of an experiment on Steve's part in that he used the same woods that he uses on the F5's to build it. I think there are a couple other modifications, but minor. Steve told me that he was completely satisfied with the way it works. The Duff 'dola is the traditional Gibson scale, made onto an H4 box design with f-hole top. Paul's making another with 17" scale to give it a bit more mandolin-like "pop". I reckon that'll be an experiment too. I've got a couple more things I bang on around here, a late 30's Kalamazoo Oriole and an Old Kraftsman florentine and a Kay electric I got from TBone Burnett. They're fun stuff with their own voices. It takes a number of different voices to get it all done for me. I suppose that's because I'm not quite good enough a technician yet to get it all out of one box." Current projects: "The Nashville Bluegrass Band is still working up new material, I think we're to begin on another recording soon. I've had a solo recording rumbling around in my head for a few years, but I just haven't felt an overwhelming urge to get it done. I don't know why. It just doesn't seem urgent somehow. But that one will basically be all original tunes by me with various combinations from solo to full band. I would like to put out a duet recording of Narmour and Smith tunes played on mandolin and guitar to pay homage to one of Mississippi's greatest duets in the string band field. Recently, the fellow who first pushed me towards Monroe's playing, Raymond Huffmaster, bought back the Randy Wood mandolin that I brought to Nashville with me in 1977, so we're looking at putting out a project of tunes played on that mandolin. I'm really looking forward to going back down to Mississippi and playing tunes with a bunch of my old friends and influences. I've wanted to go back and hang out a while there and just soak it up, and this will give me the perfect opportunity." What's next: "Who knows? I just keep plugging away and I really don't know what's coming around the bend."